I wish I had the words. I wish I could find them, just once. Just one time, in one blog post, I would love to be able to find the perfect words to describe how much I love this little boy already. I had a doctor's appointment on Monday morning before work. She just wanted to check the heartbeat and measure Connor, you know, the usual in and out kind of stuff. She measured him and then said - "Yep, he's perfect. Not too big and not too small." To which of course I thought; He's perfect, huh? A couple of weeks ago, the ladies at our Church threw me one amazing shower. We got so many wonderful gifts for Connor and for that I am so grateful. Everything looked so lovely. 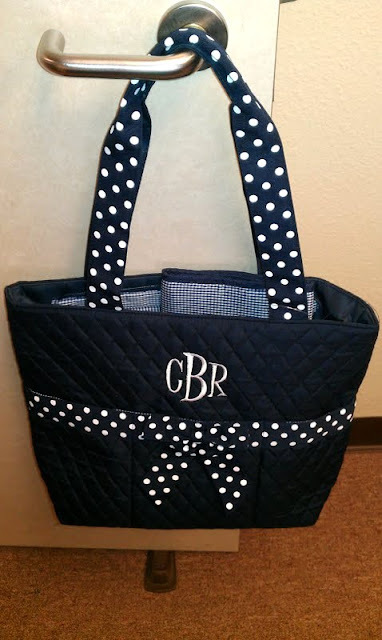 My sweet co-worker, who is always so generous and creative, embroidered my diaper bag for me this week. She did a great job! Thanks Ash. 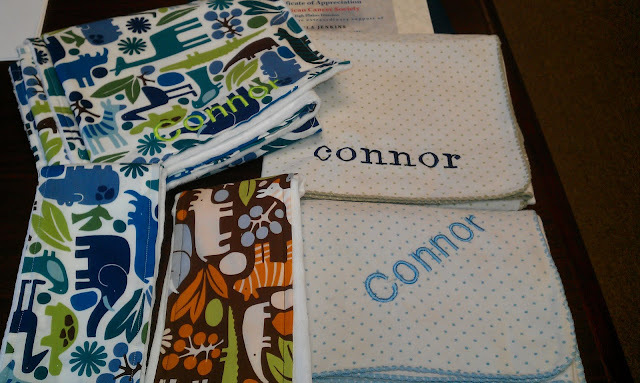 I also have another really sweet co-worker, Kathryn, who made these baby blankets and embroidered Connor's name on them for me. Do I have some amazing co-workers or what? I found this and thought maybe it would help Adam with changing diapers. ;) - "Spread the diaper in the position of the diamond with you at bat. Then fold second base down to home and set the baby on the pitcher's mound. Put first base and third together, bring up home plate and pin the three together. Of course, in case of rain, you gotta call the game and start all over again." My oh my. We are on the downhill slope now. I can't believe he will be here in 8 weeks (or less!). Not only am I really tired and super emotional, but my cute little "inny" belly button is looking like he wants to switch teams on me. It hasn't happened yet, but I give it a month or so. Connor's movements are also getting way more intense as the days go by. I love feeling him squirm and play in there, but those jabs, woah! He can take my breath away with some of those. And he has the hiccups all the time. So I choose to be a man of God. A man of God, that's exactly what I want to be. 8 more weeks, my little man. You look Beautiful, Sweetheart! Connor is blessed to have you as his momma.